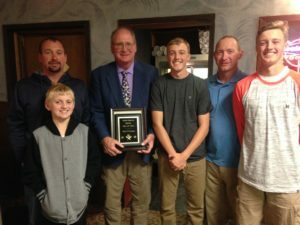 Brad Schramm of Winner was inducted into South Dakota Umpire Hall of Fame at a ceremony Sept 29 in Madison. Schramm, who has been very active as a baseball coach and umpire, said he was humbled to be inducted into the hall of fame. In 1999 Schramm started umpiring. He was the secretary of the state umpire association for 10 years and retired last February. “You do not get into the umpire hall of fame because you are an outstanding umpire. I really got elected because of all the things I have done in baseball. From 1992 to 2008, Schramm was the Region 7 commissioner for the state VFW Teeners. In 2001, he got involved in high school baseball and in 2004 took over as president of the state high school baseball association and held that position until 2018. In 1992, Schramm started coaching Teener baseball and then advanced to Legion ball when his son Robbie moved up to the Legion team. Over the years, Schramm has worked countless games at Leahy Bowl. He says he may have umpired 25 games during a summer season. He has even umpired at the state amateur baseball tournament. You have to be an umpire for three years before you can work a state tournament. He recalls that in his second year as an umpire he got called into duty. It had rained so hard in Mitchell (site of the state amateur tournament) that some of the games had to be played in Parkston. Of course, there were not enough umpires. The first call he made was a close play at first base and Schramm threw out the runner. Schramm worked six to seven state amateur baseball tournaments and several state Legion tournaments across the state. He umpired one college game when it was played in Winner. Two teams from North Dakota, University of Mary and Jamestown State met in Winner. Another memory of his early years as an umpire was a game at Leahy Bowl between the Winner amateur team and KC Cannons. Schramm was not an umpire yet but was still called to work the game. He found a powder blue shirt in his closet but told both team managers there was no umpire patch on it. All was going well until a Winner player hits the ball and it hits the plate and Brad immediately calls a foul ball. Herb Sundall of the KC team was coaching third base. He came over to have a talk with Brad. “I am not arguing but I want to know why you called that foul ball,” said Herb. Just a lot of fond memories said the hall of fame inductee. Schramm and Steve Ellsworth were instrumental in forming the Winner Baseball Association. This was an umbrella organization that included the Winner Teeners, Winner/Colome Legion and the Winner/Colome amateurs. The Winner Baseball Association is still very active. The best year for Schramm was in 2006 when Winner hosted three state tournaments all at Leahy Bowl. Winner had the state high school meet in May, the state VFW tournament and the state Legion tournament. Winner won the Legion tournament that year. Schramm remains an avid supporter of baseball.